"It's Exactly What I Wanted... And More!" This is the type of response you're after when you spend countless hours hunting for that One-Of-A-Kind gift. After all the effort you expended in that process you should expect to hear a lot of enthusiasm for your gift. 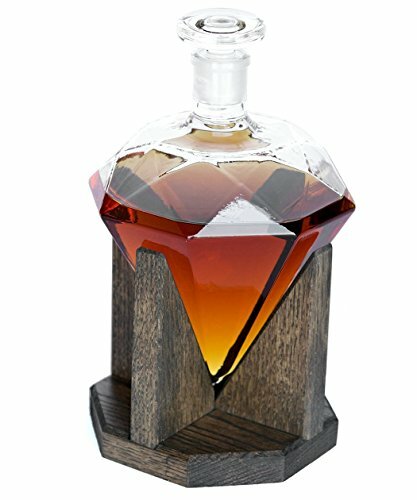 A collectible decanter that's as practical as it is beautiful. • Traps all the wonderful flavors inside without leakage. • Contains 100% glass in the decanter AND stopper. • Feels solid in your hand when you go to pour it. • Fits an entire 750ml bottle with room to spare. "This is such a conversation piece!" You'll feel proud to see this decanter being used each time you have friends and family over for drinks. Everyone will be impressed by the look of it. They'll want to know where you got it and if there are any more left (which will not always be the case). "The packaging it came in was so nice." Since this is meant to be the perfect gift we knew we had to design our packaging to rise to the occasion. That's why each step of our process has been carefully thought through so it can repeatedly surprise and delight you. These decanters are made in small batches by master craftsman. So we can only supply a fraction of the demand we have for them. Click ADD TO CART now to ensure that you'll have one. DON'T LET YOUR LIQUOR EVAPORATE - Our ground glass stopper creates a seal to last a lifetime. The pure essence of your best alcohol is preserved and not evaporated. If you have any questions about this product by Prestige Decanters, contact us by completing and submitting the form below. If you are looking for a specif part number, please include it with your message.